A lot of mystery surrounds the humble lobster. Firstly, it isn’t particularly humble – these creatures cost a lot of money. Whichever way you look at it, they’re expensive. Secondly, they’re a faff to prepare, a task which normally involves shipping a live lobster back from some market somewhere, agonising about the best way to despatch it, and then actually doing the deed. It’s all fairly straightforward, but it’s understandable why people are squeamish about it. Death in the kitchen is never a pleasant experience, even if it’s just a crustacean. There’s an easier way, though – just buy a pre-prepped pack of meat, more on which later. These ravioli are a good example, a canvas to highlight the richness and luxury of lobster meat. There’s some work involved, and a few technical elements that need mastering, but it’s all do-able and within grasp. Ravioli requires pasta. Fresh pasta. Pasta you’ve made yourself. There’s no way around that, so crack on. Making pasta is actually really easy, once you’ve got the knack of it. It’s just a dough that’s been rolled out very, very thinly. The dough is made using 150g of tipo 00 flour, 350g of fine semolina flour and five eggs, mixed together to form a rough dough, then kneaded for a few minutes until smooth and silky. The dough will, and should, be quite hard to work, but it’ll become more supple as you continue to knead and the gluten starts to develop. A crumbly dough to start with is absolutely fine – just keep sticking it back together and persevering. Wrap the dough in cling film and put it in the fridge to rest for an hour. It is indeed possible to make a rough sheet of past with a rolling-pin, but it’ll be terrible, and frankly, embarrassing. Best to get hold of a pasta machine. These machines are cheap, reliable, and last a lifetime. They’re one of those things that’s designed so well that the design simply does not need to change, and any pasta machine you can get your hands is likely to do the job. One tip – a friend of mine realised that many people have a go at making pasta, try once or twice, then get bored and relegate the gear to the back of a cupboard somewhere. He got his hands on a perfectly good machine by simply asking around. If I remember correctly, Freecycle came up with the goods, for, well, free. Once the dough has rested, divide it up into eight pieces and keep all but one wrapped. Flatten the remaining piece of dough into a rectangle and pass it through the pasta machine, set to the widest setting. Fold the dough in half and repeat this a couple of time, working the dough each time. Now it’s just a case of gradually working through the settings, thinner and thinner each time, until you reach the second thinnest setting, which should be OK for ravioli. What you’ve made is a sheet of pasta. Use it for ravioli, use it for lasagna, roll it loosely and cut across at about three-quarter of a centimetre intervals and you’ve got tagliatelle. Don’t try to make spaghetti unless you’ve got a spaghetti attachment. The only thing to watch is the stickiness of the dough. It’s possible that carefully rolled out sheets of pasta will end up hopelessly stuck together, so keep an eye on this and dust often with semolina flour. 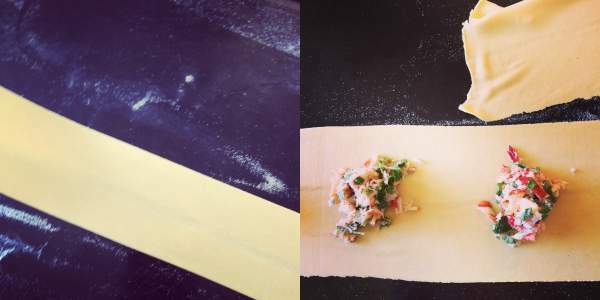 There’s a knack to rolling out pasta, so just persevere and you’ll get it eventually. Once the pasta is ready, the hardest part is done. I think the filling should be simple and straightforward, because it’s the shellfish that’s the star, and it shouldn’t be fiddled with too much. Use about 350g of lobster meat, a combination of tail and claw meat, and chop it up reasonably finely. Add a handful of chopped flat-leaved parsley, a good squeeze of lemon juice and about 100 to 150g of melted butter. Season well with salt and pepper, and that’s the filling done. Now for the construction part. Lay out a sheet of pasta on a well floured surface, and spoon a teaspoon of filling on to the side nearest to you, about two or three centimetres in from the edge and perhaps six or seven centimetres apart. Use your finger or a small pastry brush to carefully trace around each pile of filling with water, and then gently pull the sheet of pasta over the top, making sure to leave plenty of slack, so that the filling is completely covered and the long edges of the pasta meet. Gently push the pasta into place, sealing carefully. Cut each ravioli out with a sharp knife and make sure that each is properly sealed, before laying out on to a floured baking sheet. Depending on the width of your pasta sheet, it might be necessary to use a separate sheet to seal the pasta, instead of the ‘folding up and over’ technique. It will make little difference, but there will be more excess pasta to trim. The ravioli can either be cooked or frozen immediately. They’ll survive in the fridge for a few hours, too. To cook, a couple of minutes in gently bubbling, salted water is enough. Serve with a simple tomato sauce and plenty of parmesan. This recipe was made considerably more straightforward by the fact that I used a pack of prepared lobster for it, sent to me by the good people at The Colchester Oyster Fishery. It arrived in a 500g pack, a good mix of tail and claw meat, boiled, prepped, ready to go. No lobster murder involved, at least not by my hand. 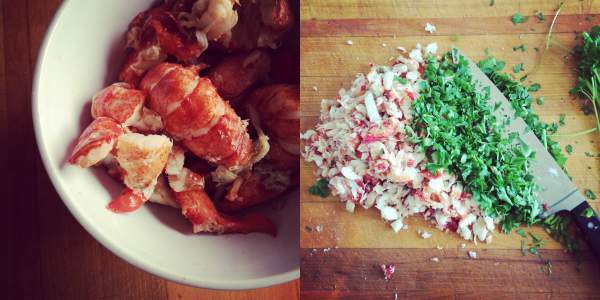 The lobster meat I used was Canadian – British lobster are out of season at the moment. The waters of the Western Atlantic represent the biggest lobster fishery in the world, divided up into several different regions with individual fishing restrictions to ensure sustainability of stocks. British lobsters come back into season late in the Spring, and are available right through to September … there are huge fisheries off Essex, Suffolk and Norfolk, as well as in Cornwall. The pre-prepped meat made a huge difference, and meant that this was a reasonably quick meal to prepare. Somebody experienced with pasta could probably knock a batch together in under half an hour. The Colchester Oyster Fishery also sent me a batch of their quite splendid oysters, grown in the coastal waters around Pyefleet. They rivalled any I’ve had from the traditional French oyster fields around places like Cancale. Sweet, juicy, and not over salty. Have a look at www.colchesteroysterfishery.com, and if you’re quick, use discount code IJRI2D12QWT2 for a healthy 15% off (expires at the end of April, 2015).